“If anything happened to my musical father, I don’t know what I should do”. The teenage Britten’s dependency on Frank Bridge, fully revealed in this quote from 1930, illustrating the extent to which his teacher was becoming his musical guiding light. Of all the composers in Britten’s adolescence, Bridge exerted the greatest influence. Purcell may have made a bigger musical impact, but Bridge was there in Britten’s day to day life, teaching, advising and becoming a very firm friend. To begin with, though, his music left an incredibly strong impression on the young Britten. At the age of ten, on witnessing a performance of the orchestral suite The Sea at St Andrew’s Hall in Norwich in 1924, he declared himself ‘bowled over’. He was similarly affected three years later, in the same venue, by the symphonic poem Enter Spring. As a composer, Bridge suffered great neglect for all of Britten’s life, and indeed up until the late 1970s. This is thought to be due partly to the timing of his death in 1941, just as the Second World War was starting, but more strongly down to a then radical move to the far reaches of tonality in his music, aligning himself closely to the Second Viennese School of Berg and Schoenberg in particular. Bridge’s early works are highly Romantic in nature, however, building on the teaching of Sir Charles Villiers Stanford, who remained famously conservative. These compositions include the passionate Phantasie Piano Trio and Phantasy Piano Quartet, some highly attractive songs, early works for string quartet such as the Three Idylls and the vividly coloured, larger scale orchestral suite The Sea. The early period culminates with the Suite for Strings, one of the composer’s finest works. Anthony Payne’s description of the early style feels just right, that Bridge channelled ‘an exceptionally fluent and logically ordered technique stemming from 19th century German methods, and tempered by a Gallic clarity and lightness”. This noted the influence of Fauré, Ravel and Debussy, whose String Quartet in G minor informed the Idylls, and was confirmed by an interview with Bridge himself in 1923, where he declared himself “English by birth but not by nationalist musical ideology”. After the First World War Bridge had started to become musically restless, his harmonies increasingly elusive, in many cases now fraught with anxiety and anger. This was confirmed by Britten, who spoke of how “the many talks I had with him, indeed everything about him, told me of the utter horror and revulsion he felt about the catastrophe”. Britten inherited Bridge’s ‘gentle pacifism’, which if anything deepened in the younger composer. The War effectively hastened Bridge’s move towards a new style, his work of the time acquiring a sharp emotional focus. The String Quartet no.2 shows hints of this, and towards the end of its second movement provides a clear precursor for Britten’s early quartet writing. The Cello Sonata, recorded by Mstislav Rostropovich and Britten for Decca, becomes almost uncomfortable in its unremitting intensity, while the anguished Piano Sonata is also highly charged, its chilly epilogue working towards the ‘strange and removed late-Bridge atmosphere’ that Peter Pirie vividly describes. Meanwhile a miniature orchestral masterpiece, the ten-minute tone poem There Is A Willow Grows Aslant A Brook, is a strangely elusive piece of wispy textures and shadowy melodies, one of Bridge’s finest pieces that finds common ground in descriptive writing and a harmonic language that moves away from conventional tonality. With the String Quartet no.3 the break with the early style is total. This remarkable work could very easily be mistaken for Berg, were it not for the occasional Bridge melodic fingerprint, a cousin of the Lyric Suite in its almost eerie intensity. The second movement is unusually ghostly, unlike almost anything in English music. Meanwhile the Oration, a concerto for cello and orchestra in all but name, is similarly focused, described by Bridge as a ‘funeral address over the lost of the 1914-18 war’. Britten did his bit to ensure Bridge’s music got something like the exposure it deserved – and not just out of a sense of duty for his friend and teacher. There is a recording of the Phantasy Piano Quartet, made by Decca in Aldeburgh in 1967 but currently out of circulation, with Britten and three members of the Amadeus String Quartet. This remarkable performance doesn’t make the mistake of giving too much too soon, saving full power until later on, from Britten’s limpid announcement of the theme, through the faster middle section, light on its feet, to the full blooded ensemble passages. Britten also conducted The Sea and Enter Spring at the Aldeburgh Festival, both recordings of commendable urgency and freshness that were happily captured by the BBC but are again unfortunately unavailable at present. Also worth noting is a joyful recording for Decca with the English Chamber Orchestra of the miniature piece for strings Sir Roger de Coverley, brightly quoting Auld Lang Syne in its final pages. At the close of his brief but revealing portrait of Bridge, Anthony Payne declares him ‘the only senior figure who had faced up to the most advanced continental developments and proved that an English composer of integrity could emerge from the experience not only unscathed but immeasurably enriched’. This definition undoubtedly carries through to the work of Britten, who met Bridge shortly after the Enter Spring premiere, where after they soon began lessons. As a teacher, Bridge instilled discipline in a similar way to John Ireland, and Britten told of how he insisted on ‘the absolutely clear relationship of what was in my mind to what was on the paper’. Whereas Ireland’s tutorials were inconsistent, those with Bridge seem to have been more frequently rewarding, and led to a close personal friendship. 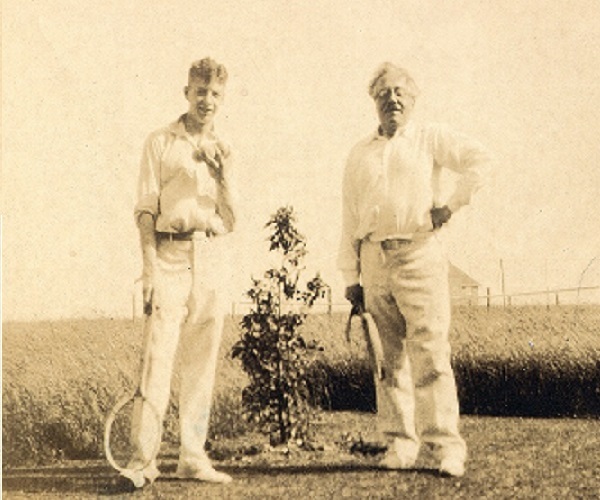 The two clearly had a lot of fun as Britten helped his elder to play tennis and drive a car properly, Bridge in turn teaching Britten why parallel sevenths on a violin weren’t so good, plus much more besides. The two had viola playing in common too, and it is tempting to think they might have played through Bridge’s poignant Lament for two violas, originally written for Lionel Tertis. Perhaps the two most important facets of Bridge’s character inherited by Bridge were a fine blend of musical discipline and freedom of expression, and that quiet but incredibly passionate pacifism. Audible influences abound, with The Sea reflected in the seascapes of Peter Grimes, Oration providing a deep and meaningful blueprint for the Cello Symphony, and, most obviously, the second of the Idylls providing the whole inspiration for Britten’s breakthrough work, the Variations on a Theme of Frank Bridge. It is gratifying to see Bridge given due recognition for his worth as a composer, not just a fine teacher – but in the latter role he could claim to have laid the foundations in the mind of one of the most distinctive musical voices of the 20th century. For this piece I read two concise but revealing volumes on Bridge, by Anthony Payne and Peter Pirie. Unfortunately neither book is easily available, but should they be either is a very workable introduction to the composer – Payne in using more musical examples, Pirie with more text. Similarly the recordings by Britten are not easily found, but it is to be hoped they will become available this year. This entry was posted in Context, Foundations and tagged Benjamin Britten, Berg, Enter Spring, Frank Bridge, Oration, The Sea. Bookmark the permalink.